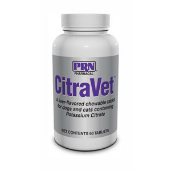 Shop for urinary tract and bladder health medications at VetDepot.com. Both cats and dogs are susceptible to urolithiasis, or mineral stones in the kidneys or urinary tract. Stones are more likely to occur in the bladder or urethra than in the kidneys or ureters, notes the American College of Veterinary Surgeons. Urinary and kidney stones can be painful and damage the lining of the urinary tract, trigger infection, and obstruct the flow of urine, an emergency situation that may damage the kidneys. Kidney and urinary tract stones primarily affect adult cats and dogs. Exactly how they form is not well understood, but there are common contributing factors. A high concentration of urinary salt is a major risk for their development. Concentrated urine in conjunction with high dietary intake of minerals and proteins can lead to excess salt in the urine. Failure to excrete these salts, an ideal urinary pH for salt crystallization, and reduced naturally occurring compounds that inhibit crystallization are other contributing factors. "Special diets and medications are often used together to help dissolve existing urinary or kidney stones and prevent new ones from forming." There are several types of stones that form in the urinary tract and kidneys. They differ primarily in composition. Struvite stones, made of magnesium ammonium phosphate, account for about half of all urinary tract stones in dogs and just under one-third of stones in cats. Calcium oxalate stones account for anywhere from 50 to 70 percent of feline stones, but are less common in dogs than struvite stones. Other common types of stones include cystine, urate, and silica stones. Bloody or cloudy urine is a typical indication of a kidney or urinary tract stone in cats and dogs. Other signs and symptoms include loss of appetite, back or abdominal discomfort or pain, depression, emesis, increased urinary output, decreased urinary output, or difficulty urinating. If you observe any of these clinical signs, note when they begin, their severity, and other descriptive information to pass along to your veterinarian. 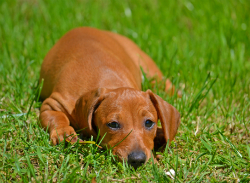 Your veterinarian considers the symptoms you describe and performs a physical examination. If a kidney or urinary tract stone is suspected, urinalysis can confirm the diagnosis. An ultrasound or X-ray provides necessary images of the stone to locate it and see its size and shape. Such details are necessary to determine how best to treat the stone. A diet specially tailored to promote dissolution of kidney or urinary stones is a key course of treatment. The stone’s composition affects the specifics of the diet. For example, struvite stones generally require decreased protein, magnesium, and phosphorous intake along with more salt to encourage the animal to drink more water and dilute the stone. 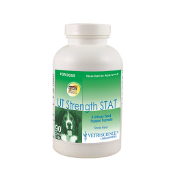 Some veterinarians may recommend that your pet a supplement like UT Strength STAT in order to help maintain proper urinary tract health and reduce the likelihood of urinary stone formation. In addition, medications are often needed in conjunction with dietary changes to help dissolve the stones. Products such as Potassium Citrate are commonly prescribed. Stones that do not efficiently dissolve may require surgical removal. Emergency surgical intervention is also needed if a stone causes a urinary blockage. The exact procedure depends on the location of the stone.